Avalon has a totally different take on pontooning, and it shows. 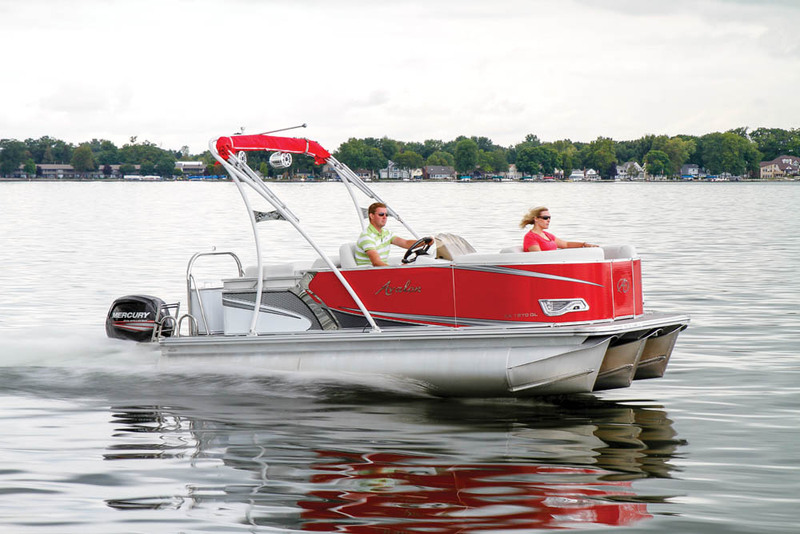 Pontoons are still one of the boating industry’s top sellers, and one of the hottest categories is compact models that are easy to tow and easy to own. Avalon proves it can go small but still remain artsy and elegant with its new Eagle 1870 QL (Quad Lounger). But the way our test boat was equipped, lounging was only one of its many talents. 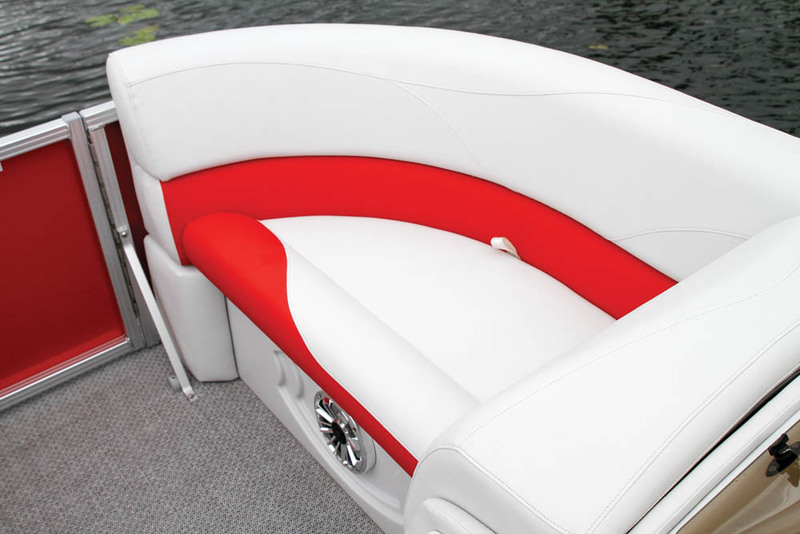 One thing about Avalon pontoons is they all have a recognizable style. Its designers are smitten with the Art Deco period, and each model — from the luxurious Ambassadors down to the Eagle line of compact pontoons — is a slice out of the same pie. Using its Deco 4 wall design element — a splash of chrome, radiused corners, optional two-tone accent paint scheme ($507) — the 1870 QL radiates luxury and sportiness. Recessed chrome docking light fixtures add a splash of flash, and the retro-modern theme is carried aboard to its simple but elegant Cadet helm station with features such as torpedo-style chrome gauge bezels that channel gauges found on cars such as the 1959 Chevy Bel Air. The driver is well-situated in a comfortable low-back driver’s seat with armrests. 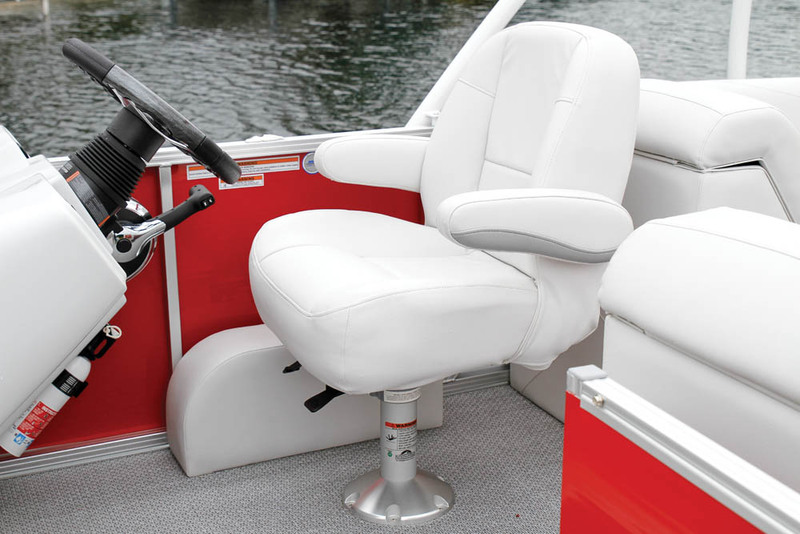 Some compact pontoon helm consoles are literally fiberglass boxes with vertical sides that have little legroom for the driver, but here the entire driver’s console is sharply slanted to provide lots of room, even for drivers who can dunk. Little touches, like the double-recessed sculpted areas molded into the lounge-seat walls, allow speakers to be mounted without having them protrude far into the living space. Not long ago, the typical compact pontoon was powered by a 15 hp outboard that provided motion and steerage but little else. Our test boat had 100 more ponies than that, in the form of a Mercury 115 FourStroke. 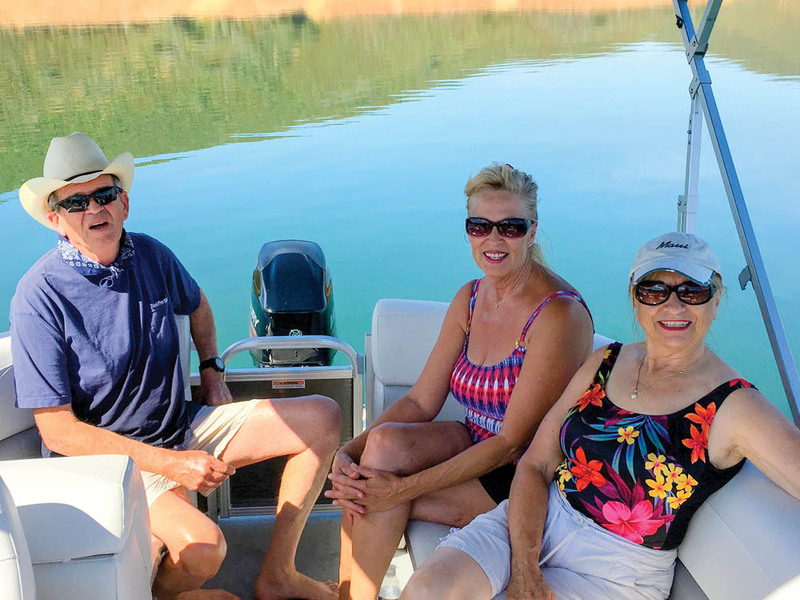 While its overall length was 20 feet, 6 inches, at least a couple of feet of that was the long engine bracket, which not only made this pontoon feel like a larger boat but also provided 100 percent use of its extended rear deck. Weighing just 1,875 pounds and sporting triple tubes, its power-to-weight ratio is well placed for solid performance. Time to plane was a brisk 2.2 seconds as the 1870 settled in on its haunches in a slight bow-up attitude, which got the front of the tubes out of the water even before the engine was trimmed out. Time to 25 mph was 7 seconds flat, and top speed was 38.1 mph, which makes it fast enough for any watersport. With its short “wheelbase,” relatively narrow seven-foot beam and the optional Avalon Extreme Turning (AXT) triple-tube package ($10,078), the Eagle 1870 is Mini Cooper nimble and fast. The outer tubes are 23-inchers and the center one is 25 inches. Normally, a larger center tube configuration gives a pontoon a propensity to lean inward on turns, but I found the cornering to be relatively flat. Even so, the package lived up to its name, showing excellent turning ability that was enhanced by Sea Star hydraulic steering. 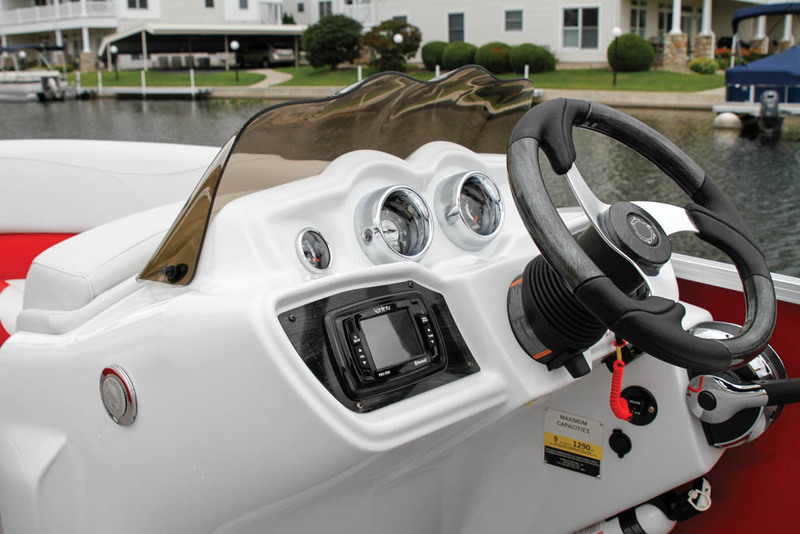 Some buyers might order this boat with mechanical steering to save a few bucks ($1,797), but they will regret it the first time their kids want to go tubing or skiing. 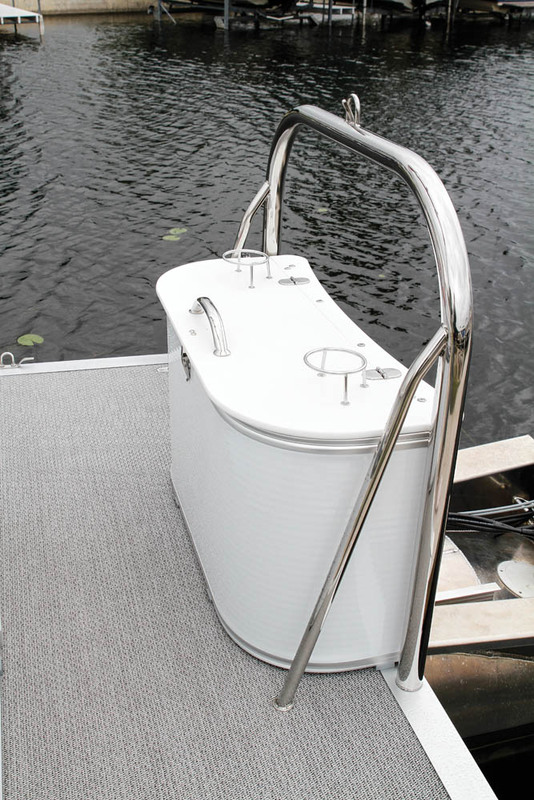 This one’s not too hard to figure out, especially when it is equipped with the optional powder-coated white aluminum wakeboard tower ($4,055), like on our test boat. It even has a Bimini top that can be unfurled for skiing and shade at the same time. The tower is full size, so it sits farther aft than on most pontoons, but it provides the high tow point wakeboarders like. Since it’s a fairly light boat with triple tubes, the wake is pretty small, but it’s a good way for junior boarders to get the hang of the sport and develop their leg-assisted launch technique. There’s a ski tow eye for tubing and slalom skiing. One of the tower’s quirks is that because it sits so far aft, the optional coffee can speakers are pointed forward instead of aft, so people in the cockpit can hear the tunes. Despite being a compact pontoon, the 1870 QL is big on entertainment. Its passenger capacity is nine, and there’s plenty of seating on quad lounges made of the same Matrix 50 seat vinyl as Avalon’s more expensive models, which company literature says is the thickest in the industry. Despite its thickness, it’s still very soft to the touch and highly resistant to stains and UV rays. As mentioned, the starboard-side loungers are shorter and are better suited for kids to recline on, but the portside rear chaise was long enough for 6-foot, 4-inch Avalon rep Greg Knight to stretch out on. Cockpit table choices abound; my favorite is the large rectangular smoked-glass version ($492) that includes four wire cupholders, four cutouts for stemware and plenty of room left over for snacks. An extensive options list allows buyers to keep it basic or load it up with goodies, depending on budget and needs. 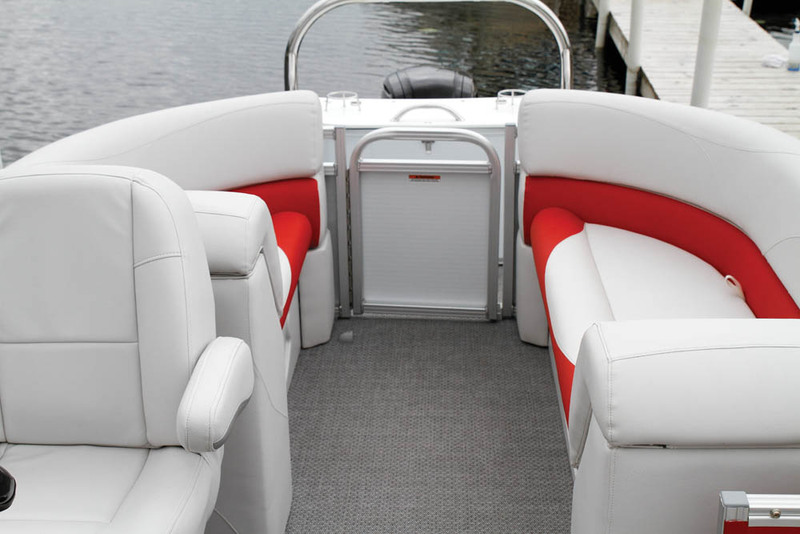 Our test boat featured the upscale Luna Metro vinyl ($2,188), which is soft on the feet and is easy to clean at the end of the day. Our boat also featured the High Performance sound system, which includes an Infiniti PRB 350 amp and a subwoofer for depth. It’s Bluetooth, so a loaded phone is all that’s needed. For boosting entertainment capabilities, add a wall-mounted grill for $359. If nighttime entertaining is in the picture, make this Eagle glow with underwater lighting ($313), under-rubrail lighting ($719) and interior mood lighting ($367). The fundamental decision is whether to make it a tortoise or a hare, performance-wise. Equipped with twin tubes and a modest 40 hp outboard, it costs well below $20,000, but if watersports and cruising are on the agenda, the Waveglider Performance Package ($7,188) and the max 115 hp outboard are musts. For better range with the triple-tube option, the standard 24-gallon tank gets upgraded to a 38-gallon tank. You can definitely fish on the QL model, and there’s an option to add a trolling motor, but if angling is one of your main activities, consider buying one of the Eagle Fish models, which come in 16- and 18-foot sizes and have dedicated fishing seats and other piscatorial amenities. Purchased by Richard and Lorelei Begley, Mariposa, Calif. Purchased at Pacific Marine Center, Madera, Calif.
We wish the Bimini top provided more coverage. My husband, Richard, and I have never owned a boat but over the years have borrowed them from family and friends, so when we retired, we decided to take the plunge and buy one. We knew we wanted a pontoon boat but didn’t want anything that was too large, so we could easily handle it and tow it. The 1870 was the perfect size for us. 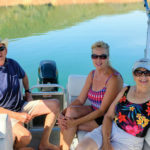 We do most of our boating on Lake Don Pedro, which is a beautiful reservoir, and take our Chesapeake retriever Jessie with us and go swimming and bird watching. We also like to fish for trout, and the Avalon Eagle makes a great fishing boat. We went to Pacific Marine Center first because they had more pontoons than anyone in the area, and we spent a lot of time asking questions and getting comfortable with the idea of buying a boat. There was no pressure, and they even encouraged us to shop around, but we knew what we wanted and got the 1870. After the sale they made sure we knew how everything worked and, even though they were quite busy, really took their time to make sure we were happy. LOA: 20 ft., 6 in.